Perseus rescued Andromeda from the Cetus (Sea-Monster). The crowned Andromeda is chained to the rocks as a sacrificial offering. Her father King Cepheus, wearing a peaked Phrygian cap and holding a sceptre, stands beside her. 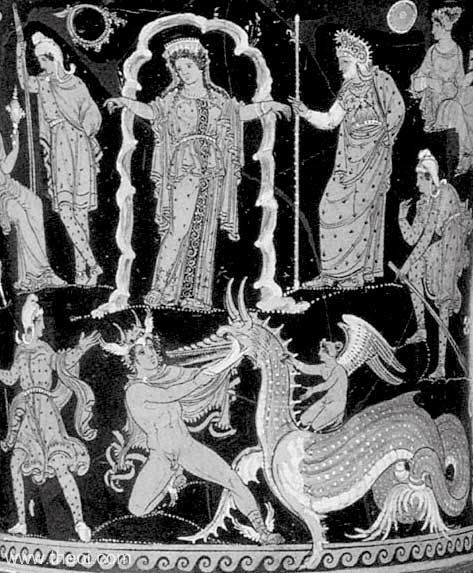 Below them the hero Perseus, wearing a winged cap and boots, battles the monster with a curved-blade (harpe). The sea-monster is depicted as a dragon-like beast with the coiling tail of a fish. Eros, the winged god of love, is seated on its back.